The Tudors are England's most notorious royal family. But, as Leanda de Lisle's gripping new history reveals, they are a family still more extraordinary than the one we thought we knew. The Tudor canon typically starts with the Battle of Bosworth in 1485 before speeding on to Henry VIII and the Reformation. But this leaves out the family's obscure Welsh origins and the ordinary man known as Owen Tudor who would fall (literally) into a queen's lap - and later her bed. For the first time in decades comes a fresh look at the fabled Tudor dynasty, comprising some of the most enigmatic figures ever to rule a country. As an unabashed lover of British royalty, I've read over 100 books on monarchs from William The Conqueror to Edward VIII (the family gets boring after that). For me, the Tudors have always been embodied by a twitchy but regal Bette Davis as Elizabeth I and the fat-boy Holbein painting of Henry VIII. But this book gives all 6 Tudors their due, in one of the most indepth accounts ever. The media has sold us on largely fictional and/or subjective views of Tudor monarchs, Henry and Elizabeth, while basically ignoring Henry VII, and Mary I, Jane Grey, and Edward VI. However, this author sets the record straight. He tells each monarch's life from beginning to end, rather than as merely side characters to the longer reigning Tudors. He also provides the reader with backstories into the people and living conditions of that era, showing the period to be awash with poverty, ignorance, and oppression. Henry and Elizabeth, who are 2 of the most remembered monarchs were certainly not the greatest. And their cruelty, greed, vanity, and selfishness was overwhelming. "Off with their heads" was more than a mere expression for them. This book is enlightening, educational and entertaining. The author pulls no punches yet still allows the reader to judge for him/herself as to the short but turbulent reign of the Tudors. At 24.5 hours in length, it's hard to believe that any more could be written about this dynasty - this has got to be the best researched book EVER on the subject. 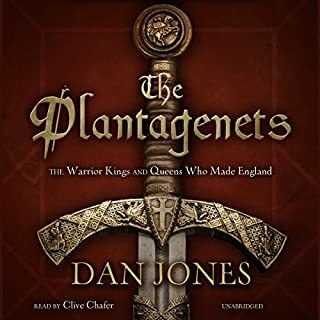 I'd like to see the author write a "prequel" about the Plantagenets who gave England 14 kings over a span of more than 300 years vs. the Tudor reign of only 118 (83 years combined between Henry VIII and Elizabeth I). This is the only book that I've bought here which is worth 2 credits. I, like many people, have always been fascinated by the Tudors. 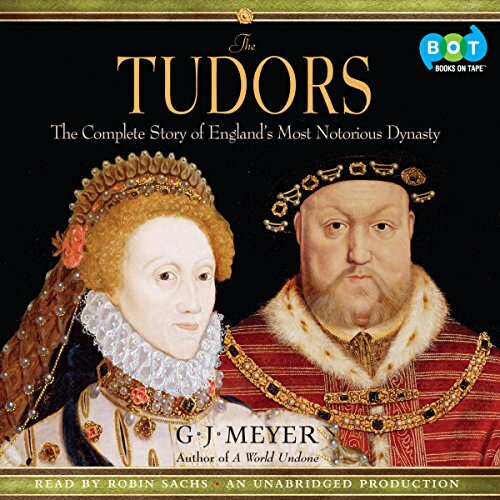 Perhaps it is because of our popular culture, from the BBC to our movies, but the Tudors have always seemed like a remarkable group of rulers so I was particularly interested in G J Meyer's book on them. It was all I could have asked for and more. My Meyer's examination of the Tudor dynasty, from Henry VII through Elizabeth I, is thorough, detailed and incisive. The book is full of detail, in some cases almost too much detail, and leaves little to the imagination. His indictment of the Tudors flies in the face of today's cultural view of the Tudors, but leaves little doubt as to the validity of his assessment. 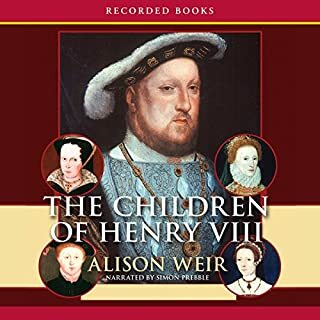 Understandably much of the book centers on the two best known Tudor monarchs – Henry VIII (or, perhaps we should say Henry VIIJ as you will read in the book) and Elizabeth I – although Henry VII, Edward VI and Mary I are hardly ignored. Mr Meyer's indictment of both Henry VIII and Elizabeth I are based on fact and opened my eyes to a part of history that I did not know. Most of what I knew about Henry was related to his break from the Catholic Church and his efforts to secure a male heir. While I have always condemned what I saw as his “excesses” I thought I understood his desperate search for a male heir since there had never been a successful British Queen before that time. However I never really knew how much of a tyrant he was and I never really knew how much the British Parliament of his day had been made a creature of the crown. His slaughter of all of those who stood in his way, and of those who served him faithfully, are facts ignored by most contemperary accounts, at least those with which I was familiar. His description of Elizabeth's reign also brought to my attention much I never knew. I had always thought that Elizabeth failed in perhaps her main responsibility to the British state – marrying and producing a successor – and I always thought that she did so out of her own selfishness, but I never knew much about her persuit of practicing Catholics in the country. I knew of the general policy and I knew about how her agents persued Catholic Priests to arrest them, but I never really felt that I knew why they did so. Mr Meyer explained the thinking behind this policy and, perhaps, why British policy up till the 20th century continued to exclude Catholics from most government positions. None of this is meant to excuse this policy for Mr Meyer makes clear that most Catholics, including those slaughtered for their beliefs, were loyal British subjects. In particular the story of Edmund Campion ended for me the idea of “Good Queen Bess”. In A Word Undone, Mr Meyer's history of World War I, he alternated chapters between events and background information. His background sections were particularly helpful in explaining the “whys” in what was happening. He uses the same technique in this book, although there are not as many background chapters, to explain why things were as they were, why particular policies were followed and why particular solutions worked or did not work. I found this extremely helpful in understanding what was happening during the 120 or so years of the Tudors. Another thing I took away from this book is an understanding of how stable today's politics are compared to the world of the 16th century where the English, French, Spanish and Hapsburgs were constantly making and breaking alliances for the most transient of reasons. This book is narrated by Robin Sachs who does a splendid job. I recommend this book to anyone who has an interest in the period of the English Reformation or to those interested in British history of any period. So much of what happened during the reign of the Tudors is central to what came after that this book is enormously helpful in understanding events that happened hundreds of years after the last Tudor monarch died. What did you love best about The Tudors? Telling the truth about three of the most ruthless monarch's of England. I watched the romanticism of the HBO series The Tudors and knew that their telling of the story of Henry could not be correct. Quite frankly not even realistic. So, I saw this in the book store and wanted to get another point of view. I am glad I did. This seems much more true to what the monarchy of England, at that time was like. What other book might you compare The Tudors to and why? I, Claudis. I would compare because of the nature of their unrelenting power, that only stopped in their deaths. No real character favorite. He made them all come alive. If you could sum up The Tudors in three words, what would they be? This is the overall the best account (by far) I've read/heard on the Tudors. By providing a good deal of background information that puts the events and personages in a meaningful historical perspective, it leads us to a deeper as well as broader understanding of the era and of the players, and revises our vision. Dudley, whom I used to see as more foolish and rash. One thing that comes through clearly in this book is how much the glamorous view of the Tudors was deliberately created through propaganda. And how great a difference there is between how Henry and Elizabeth wanted to see themselves and how they were. Some reviewers here object to the author "hating" Elizabeth. This seems to me off the mark. Our sympathy or antipathy to people of the past come from what we know of them, and to the extent that we learn more, our feelings change: we have no personal relationship with them and cannot know them except through books and documents. If what we've read has helped us develop strong feelings toward one or another, it is all to the good if other books come along to correct our illusions It does not seem to me that the author is in any way prejudiced against Henry or Elizabeth: in presenting many repulsive aspects of their behaviour that shatter the idealistic visions one might have had, Meyer is only drawing us closer to an objective and realistic appreciation. 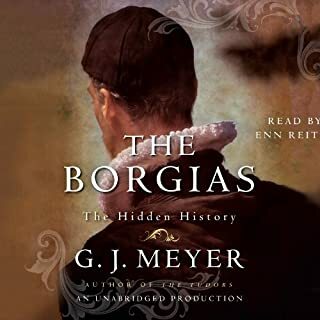 I was struck by Meyer's brief evocation of Pope Alexander VI in this book as a monster: this is the received view that he would overturn in his next book 'The Borgias'. This would appear to illustrate his open-minded attitude toward historical inquiry, although one could more cynically take it as interested exploitation of contrarian views (an interpretation utterly refuted by the outstanding quality of his books, foremost perhaps his outstanding account of World War I). The more I learn of history, the more I realize that famous people of the past are often not what they have been made out to be. And each time we revise our view of someone or something, we gain insight not only into that particular subject but into humanity itself. This is why history is of such passionate interest. G.J. Meyer has a gift for popular history, illuminating many strange corners of a period while keeping up a steady forward pace. I enjoyed this book, especially with Robin Sachs's narration. But I have to wonder about Meyer's determination to "do" the Tudors, because boy, does he HATE them -- all of them, even the glorious Queen Elizabeth. No scurrilous anecdote goes unearthed, no tendency toward tyranny unexamined. Liars, cheats, and murderers all, in Meyer's opinion. For Henry VIII, it seems no more than his due: his monstrous self-absorption comes as no surprise (especially to anyone whose first impression of him comes from "A Man for All Seasons"); a case could be made that Mary, despite the best of intentions, was divisive and destructive, especially with her marriage to Phillip of Spain; even 16-year-old Edward showed traces of religious fanaticism; but Elizabeth?? Meyer, how could you? Each chapter of narrative alternates with a chapter of "Background," exploring different issues like the dissolution of the monasteries and continental politics. These function as interludes or extended footnotes, and despite their topical organization they often contain stories as vivid as those of the main chapters. The whole thing speeds by very quickly without skimping on detail. It's a good choice for getting an overview of the period and the dynasty. But if you tend to think of Elizabeth as "Gloriana" first and Cate Blanchett second, prepare for a shock. This book is a good overview of the Tudor Dynasty. There are some drawbacks but they are not bad enough to not read this book. First of all, this book is not exhaustive regarding all six wives. In fact, the book barely mentions the wives after Anne Boleyn. I am now reading "The Six Wives of Henry VIII" by Alison Weir to compensate for this loss. Also, the way the author jumps back and forth in time is annoying. On the positive side, I learned a great deal from this book. There is lots of good info on Thomas Wolsey and Thomas Cromwell. There are chapters in the book called "Background" chapters and they are fascinating. Robin Sachs is an excellent narrator for this book. Would you listen to The Tudors again? Why? No, the book made me feel sick inside when you realize how crazy the Tudors really were. G. J. Meyer takes away the glossy photo paper and lets you see them all as they were. Can't change history. I am grateful for the insights. I'm still rather taken aback at how self posessed and vain they all were. Have you listened to any of Robin Sachs’s other performances before? How does this one compare? No this is my first time listening. He didn't sound all that enthusiastic in his topic, and I think it is reflected in his inflection. Also the tone of this voice is a little to "bassy" and hurt my ear drums, so I could only listen to him for a couple of hours at a time. This was after I fixed the audio out on various radios to tone down how deep he sounded. Yes, but the narrator prevented me from doing so. Other than Norman Cantor, I have never had my eyes opened more about the underbelly of that reality. As Cantor reviled "honour & chivalry as tools to convince men to go to battle for little to no gain" Meyer showed me how very little acclaim and worth the Tudors. Their fame similar to the Borgias is not out of good deeds and solemnity, but due to their notorious and mercurial natures. Meyer even managers to take the darling Gloriana and prove what a terror and shallow human being she really was. I used to think that I would have loved to have met her, now I think I'd rather watch from the sidelines. None of them were "great leaders" other than Henry VII. He managed to get the world in order again for England (even if he taxed and financially penalized them to death), but he provided stability with the lack of vanity that was so normal for the day.Meyer has opened my eyes to at least continue my research in text that show less favorable light for the Tudor Era. Well written and excellently read. Worth two credits. If you're considering this one, you'd better be "into" the details of Henry's break with Rome - the who-did-what-and-when of it takes almost an entire 1/3 of the book. In a nutshell: he threw a temper tantrum when the Pope balked at annuling his first marriage ... and while the king was at it, he dissolved the monasteries in England so as to plunder them for himself. Oh yeah, he was draw-and-quartering everyone who disagreed with him. Nasty, nasty brute that one! Edward didn't last long, and was Protestant, but he "admired" Mary, so that's something (that he liked Elizabeth, too, isn't mentioned). Of course, his admiration didn't stop him on his deathbed from trying to get Lady Jane Grey installed next. Sympathy for her plight from Meyer, possibly to the extent that her pre-empting Mary would have been worth avoiding Elizabeth. Mary meant well, and yes she burned a lot of Protestants, but her father and sister were worse when it came to heretics. So there! Elizabeth ... was just horrible. A real chip off the old block from her dad in terms of selfishness and greed. She persecuted Catholic priests, who knowingly entered the country illegally, seemingly for the fun of it; Meyer neglects to mention that the Pope had called for all good Catholics to overthrow her(assassination, if necessary, was absolved from the sin of murder). That Mary Queen of Scots fell for the Protestant bait, incriminating herself in the plot to do just that (overthrow her cousin) was also conveniently omitted. If you want to experience a 400-year-old grudge vented, this is your book! Narration is good, the book starts off on a reasonable note, and the historical asides are often interesting, so a second star for those. The narrator is clear, concise, has a good cadence, and is overall excellent. 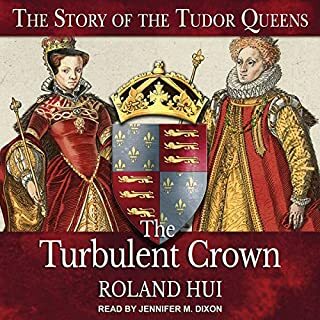 The author does a good job of covering almost 120 years of Tudor rule, though the largest percentage of his story is devoted to Henry VIII (maybe half the book?? with the other half devoted to 4 other monarchs). However, this seems reasonable given the profound religious and cultural changes instituted by that great English monarch. The author does an excellent job of setting the stage for major events and addressing, at high levels, factors contributing to various decisions made by the players. If you have only a little familiarity with the subject at hand, this audio book MIGHT be for you. Over-and-over the author talks about the characters, events, and consequences of Tudor rule through a 21st century lens of neuve morals and modern journalistic judgmentalism. The author makes it clear he’s not trying to write anything scholarly, which is fine (very good, actually), but for anyone on the lookout for revisionist history writers, put your defenses up. Facts are facts, and the author covers many, but many facts are framed in such a way that this book FEELS like an account of Adolf Hitler’s or Saddam Husain’s regime. This is of course an exaggeration, but fair in my opinion given how one sided his view of Tudors seems to be. What made the experience of listening to The Tudors the most enjoyable? This is one of the best books I have listened to or read on The Tudors. I know there is no such thing as an unbiased historical account but I really felt the author attempted balance and neutrality. I also enjoyed the fact that Henry VII was included in the story as he often gets forgotten about. I thought this was particularly well told and fascinating start to the Tudor era. Without even thinking..it is Henry VIII followed by Elizabeth. Their stories are without doubt fascinating and hugely dramatic. What does Robin Sachs bring to the story that you wouldn’t experience if you had only read the book? The reader was particularly professional and easy to listen to. No. I wanted to listen to this book little and often to absorb the information and think about the historical characters and events. If you are looking for a book on the Tudor era I would highly recommend this above others. The research is in depth and no stone goes unturned. In my opinion one to listen to many times as there is so much information it is impossible to absorb it all in one read. It's quite clear that Mr Meyer brings a significant amount of baggage to this history. His slant on many of the events of the period and the personalities of Henry and (especially) Elizabeth clearly show definite opinions (usually negative) in the interpretation and choice of language. To be fair the author does say at the beginning that the book is written entirely from secondary sources and that many of those authors would not agree with his interpretations. Still it is refreshing to hear an alternative view, though I sometimes did find the narrative led me to start arguing with Mr Meyer in my head and I had to skip the last two hours as I'd had enough. Finally kudos to Robin Sachs for some great narration. What did you like most about The Tudors? A well-structured book, which glides through these tumultuous times with an ease and grace not always found in history writing. The narrator's mellifluous tones really enhance the prose and provide an absorbing listen, which I thoroughly recommend. What other book might you compare The Tudors to, and why? 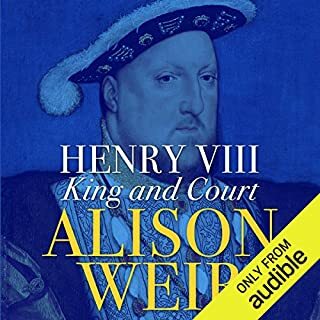 The book most like this is David Starkey's 'Six Wives of Henry VIII' as they both delve in to the detail in a lively and interesting way, which keeps the reader/listener enthralled while providing a disciplined framework for absorbing the facts. His voice is very soothing and he enunciates clearly, which is very helpful. He takes it at a gentle pace and keeps his tone lively so one doesn't lose interest. Yes, if at all possible, although one would have to stay up for more than 24 hours to do so. I will be listening to this again and again as it contains many important facts and descriptions presented in ingenious ways. I particularly like the background pieces, which focus on the details of life at the time. Clear, concise and to the point, providing excellent synthesis and frequent interesting insights. Written in a style that is liberatingly free from the excess of detail and manifold subclauses that so often mar the writings of British historians. Here you get all the detail you need, but nothing that obscures the larger view. Meyer is also highly entertaing and often funny. In addition, the book is organized so that after each chapter there is a section with 'furhter background'. This seems peculiarly suitable to the audiobook format, since it allows you to easily scroll past that section and go on to the next chapter where the story resumes if you prefer a more direct pace. The reading is excellent with just the right tone of irony where so required. Will be reading it again, so much information to remember and absorb. Thoroughly recommend it. Great commentary. I found this to be very one sided and biased throughout. The author just falls short of blaming global warming on Henry and Elizabeth. Although they were both deeply flawed, they are portrayed as totally negative . On the other hand Mary's murder of those refusing to revert to Catholicism is glossed over and Mary Queen of Scott's is totally defended. Even the horrific Paris massacre of the French protestants is justified. Things are never this black and white- for any of history's main players. Has The Tudors put you off other books in this genre? What three words best describe Robin Sachs’s voice? Did The Tudors inspire you to do anything? Yes, not to listen to any more books by this author. 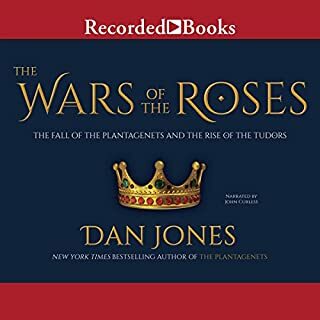 Having listened to the author's book on The Borgias where he said at the beginning it was not the book he expected to write, ie he doesn't think they are as evil as painted, I was forewarned that his view of the Tudor dynasty could be interesting. He comes down very firmly on the opposite view of the Tudors and can't imagine why they are still thought to be good monarchs. Just to complete the picture, he has an obvious soft spot for Mary, or Bloody Mary as many of us know her, while he really can't stand Henry VIII and Elizabeth. I prefer a less partisan approach. The other problem I have is a personal one only - he is upfront about using secondary sources. I prefer published historians to have done at least some of the research from primary sources.